With our modern chic design and spaciousness, Red Chopsticks offers a unique experience for any large gatherings. Whether you are involved with a business meeting or a birthday celebration, our Lazy Susans present an ideal setting for conversations. 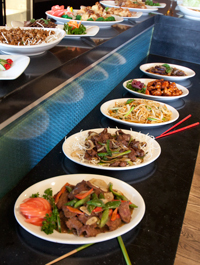 About the only thing more perfect for the occasion than the Lazy Susan is our outstanding meals.